Choose a region from the list. Click the legend to turn layers on or off. Hover your mouse over the display to reveal data. While the presence of many water pollutants can lead to decreases in coastal water quality, four interlinked components related to trophic state are especially critical: nutrients (nitrogen and phosphorus), chlorophyll-a, dissolved oxygen, and water clarity. “Trophic state” generally refers to aspects of aquatic systems associated with the growth of algae, decreasing water transparency, and low oxygen levels in the lower water column that can harm fish and other aquatic life. Nitrogen is usually the most important limiting nutrient in coastal waters, driving large increases of microscopic phytoplankton called “algal blooms,” but phosphorus can become limiting in coastal systems if nitrogen is abundant in a bioavailable form (U.S. EPA, 2003). Nitrogen and phosphorus can come from point sources, such as wastewater treatment plants and industrial effluents, and nonpoint sources, such as runoff from farms, over-fertilized lawns, leaking septic systems, and atmospheric deposition. Chlorophyll-a is a surrogate measure of phytoplankton abundance in the water column. Chlorophyll-a levels are increased by nutrients and decreased by filtering organisms (e.g., clams, mussels, or oysters). High concentrations of chlorophyll-a indicate overproduction of algae, which can lead to surface scums, fish kills, and noxious odors. Low dissolved oxygen levels and decreased clarity caused by algal blooms or the decay of organic matter from the watershed are stressful to estuarine organisms. Reduced water clarity (usually measured as the amount and type of light penetrating water to a depth of 1 meter) can be caused by algal blooms, sediment inputs from the watershed, or storm-related events that cause resuspension of sediments, and can impair the normal growth of algae and other submerged aquatic vegetation. This indicator, developed as part of EPA’s National Coastal Assessment (NCA), is based on an index constructed from probabilistic survey data on five components: dissolved inorganic nitrogen, dissolved inorganic phosphorus, chlorophyll-a, daytime dissolved oxygen in bottom or near-bottom waters (where benthic life is most likely to be affected), and water clarity. The data for this indicator are presented in EPA’s fourth National Coastal Condition Report (U.S. EPA, 2012a). The survey was designed to provide a national picture of water quality by sampling sites in coastal waters throughout the United States, including Alaska, Hawaii, Puerto Rico, Guam, the U.S. Virgin Islands, and American Samoa. Each site was sampled during the summer months; thus the indicator reflects average condition during the summer. Different regions were sampled during different years between 1999 and 2006. Data are sufficient to show differences in trophic condition over time for four regions (Northeast Coast, Southeast Coast, Gulf Coast, and West Coast). Key factors like sediment load, mixing processes, and ecosystem sensitivity naturally vary across biogeographic regions and even within regions. Thus, reference guidelines for nutrients, water clarity, and chlorophyll-a were established based on variable expectations for conditions in different biogeographic regions. For example, due to Pacific upwelling during the summer, higher nutrient and chlorophyll-a concentrations are expected along the West Coast than in other regions. Water clarity reference guidelines are lower for coastal waters that support seagrass than for naturally turbid waters. A single national reference range of 2-5 milligrams per liter (mg/L) was used for dissolved oxygen, because concentrations below 2 mg/L are almost always harmful to many forms of aquatic life and concentrations above 5 mg/L seldom are (Diaz and Rosenberg, 1995; U.S. EPA, 2000). The process of classifying individual sites varies by region and is described in detail, along with the regional reference conditions, in the fourth National Coastal Condition Report (U.S. EPA, 2012a). Water quality along the Northeast Coast has remained relatively stable over time (Exhibit 1). A substantial portion of the Southeast Coast had low or moderate water quality, with a noticeable decrease in high water quality between 2000 and 2006. The Gulf Coast consistently scored moderate through the years sampled, but saw an increase in high water quality and decrease in low water quality in the 2005-2006 time period. More than 70 percent of the coastal areas of the West Coast, Southeastern Alaska, Southcentral Alaska, Hawaii, and American Samoa had a high water quality index in the years sampled. A substantial portion of the coastal areas in Guam, Puerto Rico, and the U.S. Virgin Islands had high and moderate water quality in 2004. Nitrogen concentrations were low in almost all coastal waters sampled throughout the period of record (Exhibit 2). Several regions (Southeastern Alaska, Southcentral Alaska, American Samoa, Guam, Puerto Rico, and the U.S. Virgin Islands) had low nitrogen concentrations in more than 90 percent of the areas sampled. The Northeast Coast consistently had the largest percentage of area with high concentrations (4.7 to 7.6 percent), although the percentage of area with moderate and high nitrogen concentrations in the Northeast decreased over time, and this change was statistically significant (U.S. EPA, 2012a). The West Coast also saw a decrease in the proportion of coastal area with high concentrations over time. Hawaii showed an increase in percentage of area with low concentrations and a decrease in area with moderate and high concentrations between 2002 and 2006. The shift in concentrations is most likely associated with the focused sampling on the urbanized estuaries of Honolulu in the 2002 survey (U.S. EPA 2012a). Most regions had low to moderate phosphorus concentrations throughout the sampling period (Exhibit 3). The West Coast, American Samoa, Hawaii, and Southeastern Alaska had predominantly low concentrations, while the Northeast, Southcentral Alaska, Puerto Rico, and the U.S. Virgin Islands were dominated by moderate concentrations. The largest proportion of area with high phosphorus concentrations was in the Gulf Coast in 2002 (28.5 percent). Some regions experienced fluctuations in quality over time—most noticeably the Southeast Coast, Gulf Coast, and Hawaii. Chlorophyll-a concentrations varied over time and by region (Exhibit 4). In Southeastern Alaska, Southcentral Alaska, American Samoa, Guam, and the U.S. Virgin Islands, more than 90 percent of the coastal area had low chlorophyll-a concentrations. High chlorophyll-a concentrations were most prevalent in Hawaii in 2002 (13.0 percent) and in the Southeast Coast in 2001 (14.4 percent) and 2003 (12.8 percent). In Hawaii, the area with low chlorophyll-a concentrations increased from 70 percent in 2002 to 100 percent in 2006, but this difference actually reflects a greater focus on the urbanized estuaries of Honolulu in 2002 (U.S. EPA 2012a). Low chlorophyll-a concentrations in the Southeast Coast increased from 17.4 percent in 2000 to 52.7 percent in 2002, but then decreased to 23.8 percent in 2005–2006. High chlorophyll-a concentrations in the Gulf Coast steadily increased from 4.2 percent in 2000 to 8.8 percent in 2004, but then dropped to 4.0 percent in 2005–2006. While effects vary with temperature and salinity, as a general rule, concentrations of dissolved oxygen above 5 mg/L are considered supportive of marine life, concentrations below 5 mg/L are potentially harmful, and concentrations below 2 mg/L—a common threshold for hypoxia—are associated with a wider range of harmful effects (e.g., some juvenile fish, crustaceans, and mollusks that cannot leave the area may die). More than 90 percent of coastal area in Southeastern Alaska, Southcentral Alaska, Hawaii, Guam, and Puerto Rico had dissolved oxygen levels above 5 mg/L, and these regions had no hypoxic waters (below 2 mg/L). Other regions had dissolved oxygen levels above 5 mg/L in at least 60 percent of their coastal waters, except for the Southeast Coast in 2005–2006 (Exhibit 5). The Gulf Coast and Southeast Coast had the largest proportion of hypoxic waters. Water clarity varied over time and by region (Exhibit 6). Water clarity surpassed reference conditions (i.e., higher clarity) in more than 90 percent of the coastal waters of the West Coast, Southeastern Alaska, Hawaii, and Guam. The Southeast Coast, Gulf Coast, Southcentral Alaska, and Puerto Rico had the largest proportion of area with low clarity. The proportion of the Southeast Coast with high water clarity decreased from 80 percent in 2000 to 46.2 percent in 2005–2006. The Northeast Coast showed a slight decrease in clarity in the most recent sampling period (2005–2006). The NCA surveys measure dissolved oxygen conditions only in estuarine waters and do not include observations of dissolved oxygen concentrations in offshore coastal shelf waters, such as the hypoxic zone in Gulf of Mexico shelf waters. At each sample location, the components of this indicator may have a high level of temporal variability. This survey is intended to characterize the typical distribution of water quality conditions in coastal waters during the summer. It does not consistently identify the “worst-case” condition for sites experiencing occasional or infrequent hypoxia, nutrient enrichment, or decreased water clarity at other times of the year. This indicator is based on an analysis published in EPA’s fourth National Coastal Condition Report (U.S. EPA, 2012a). Southcentral Alaska data were presented in the third National Coastal Condition Report (U.S. EPA, 2008). The NCA data are housed in the National Coastal Database (U.S. EPA, 2012b) (https://www.epa.gov/national-aquatic-resource-surveys/data-national-aquatic-resource-surveys). Diaz, R.J., and R. Rosenberg. 1995. Marine benthic hypoxia: A review of its ecological effects and the behavioral responses of benthic macrofauna. Oceanogr. Mar. Biol. Ann. Rev. 33:245-303. U.S. EPA (United States Environmental Protection Agency). 2012a. National coastal condition report IV. EPA-842-R-10-003. 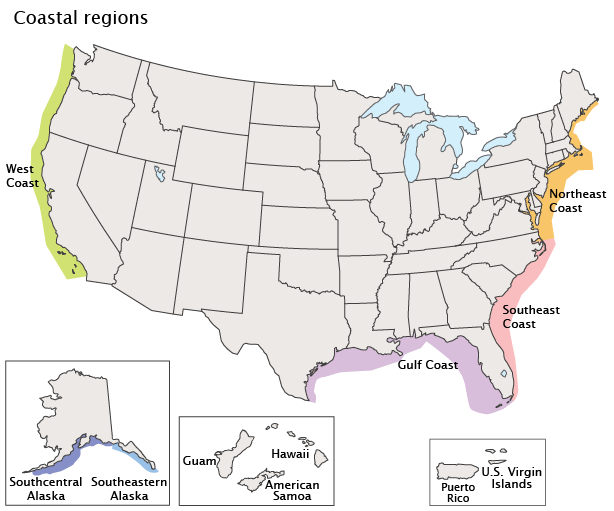 April 2012. https://www.epa.gov/national-aquatic-resource-surveys/national-coastal-condition-report-iv-2012. U.S. EPA. 2012b. EMAP national coastal database. Accessed September 2012. https://www.epa.gov/national-aquatic-resource-surveys/data-national-aquatic-resource-surveys. U.S. EPA. 2008. National coastal condition report III. EPA/842-R-08-002. December 2008. https://www.epa.gov/national-aquatic-resource-surveys/national-coastal-condition-report-iii-2008. U.S. EPA. 2003. Mid-Atlantic integrated assessment, MAIA—estuaries 1997-98, summary report. EPA/620/R-02/003. U.S. EPA. 2000. Ambient aquatic life water quality criteria for dissolved oxygen (saltwater): Cape Cod to Cape Hatteras. EPA/822/R-00/12.